Several of you have caught the “Hopscotch Bug” and are creating AMAZING things in Hopscotch! 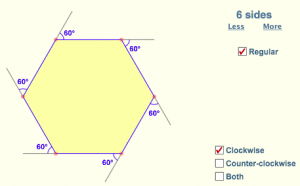 For this week’s Math Minute, you’ll be using Hopscotch to draw some polygons. Please email the EY coordinator in your building about creating a Hopscotch account. Copy the chart from the video onto a piece of paper, or create the chart on your iPad. NOTE: You can go past a 12-sided figure if you want. As the video suggests, fill in the chart with the remaining information (polygon names and angles). Send a picture of your completed chart and a screenshot of the polygons you created in Hopscotch. What are convex and concave polygons? What are supplementary angles? What does that have to do with this activity? 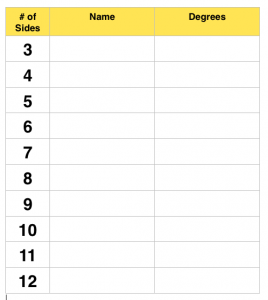 How did you figure out which number to enter for the degrees in the Turn Command in Hopscotch? Leave a comment with the answer to one of the questions above and/or post any new information you learned/observations you made. Remember when leaving a comment to include your first name, grade, and school (i.e. Trevor, 3, Sunset). I’ve done coding (programming) on Khan Academy before but this was different. It had a similar difficulty level as Khan, but I guess I shouldn’t be comparing them if I already know they are different. It’s kind of difficult, so good luck everyone! He didn’t do the 5 space which obviously is the pentagon because penta means 5. The degrees of this shape is basically what Evan said (71).